Abingdon Operatic Society are thrilled to bring you this amazing and popular musical. Nominated for 9 Tony awards including Best Musical, Oliver! was the winner of the award for the Best Original Musical Score in 1963. It was also nominated for the Laurence Olivier award for Best Musical Revival in 1995 and again in 2010. The talented cast, with the help of some youthful and gifted local performers, will transport you to Dickensian London to tell a tale of heart-wrenching emotion. 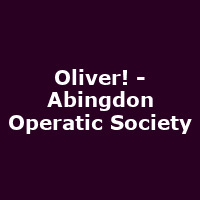 Orphaned Oliver has the boldness to ask for more and is banished from the workhouse and branded a troublemaker. He is sold to a local undertaker, but escapes and finds himself wandering alone in London. Soon spied and befriended by the resourceful Dodger, he is introduced to Fagin and his young gang of rouges. Will Oliver survive in this hostile and shadowy environment? Will he be able to find friendship and comfort on the hard, cold streets of London? This show features many popular and successful songs, including "Consider Yourself", "Pick a Pocket or Two", " I'd Do Anything", "As Long as He Needs Me", "Reviewing the Situation" and, of course, "Food Glorious Food".